Eastern Red Cedar transplants grow to become a very dense, columnar ornamental that is excellent as a windbreak or privacy screen. It is actually not a true Cedar, but rather a Juniper…somewhere in the past, the name just stuck. Although they grow at a fairly decent rate for an evergreen, Eastern Red Cedar transplants mature to heights of only about 40 feet. This low mature height makes them perfect for areas under power lines, etc. The dense and rot resistant wood of Eastern Redcedar is famously used in cedar chests, cedar closets and outdoor applications such as fencing. The root system of this species is very dense, making it a perfect tree for erosion control. Eastern Red Cedar is excellent for developing wildlife habitat on your property, offering birds cover for nesting, and berries as a food source during stressful winters. This species of evergreen grows as far south as Texas and Florida, and as far west as Oklahoma, Nebraska and Kansas. 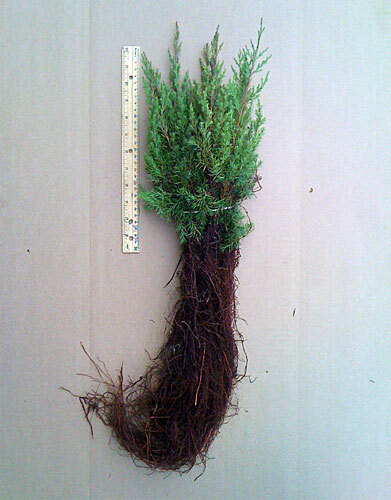 However, Eastern Red Cedar requires light, well-draining soil, and does not need a lot of watering. Rich soils and lots of water can result in root rot, which can kill the tree. This species is great in poor soil, or for lazy people who just want to plant and [almost] forget. Watering is only necessary in the first year after planting, when the roots can’t reach deeply enough for year round moisture. Interestingly, Eastern Red Cedar are a mixture of male and female, with the females producing minuscule flowers and blue berries. The males produce what look like pine cones [but are actually pollen-producing structures]. It is impossible to determine male vs. female until they reach maturity and produce the telltale signs. Although the females must be pollinated to produce the seed-bearing fruit, there are enough cedars throughout the US that even an isolated female should bear fruit, since pollen can remain airborne for many many miles. Eastern Red Cedar often turn a reddish or even purplish color due to winter exposure, and to the untrained eye one might conclude that they are damaged or dying. 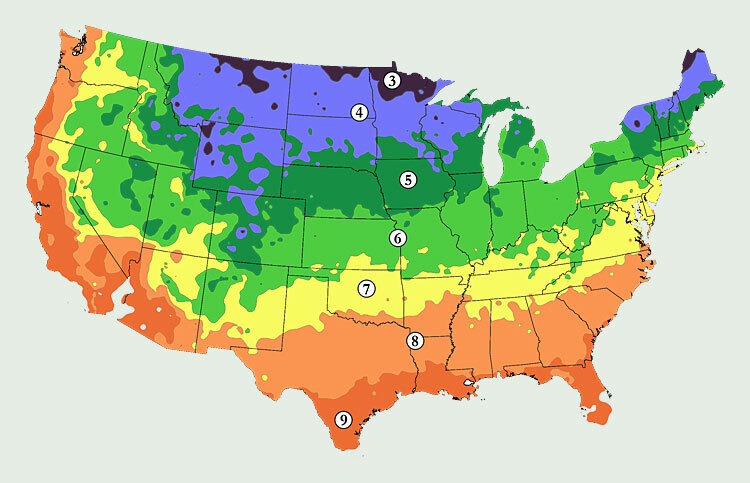 However, this color change is quite normal, and the trees will green up quickly in the warmer weather of Spring.